Combining Audient’s award-winning analogue and digital conversion recording technology with the world’s best speaker-cab simulation from two notes, Sono is home to the ultimate valve guitar preamp. 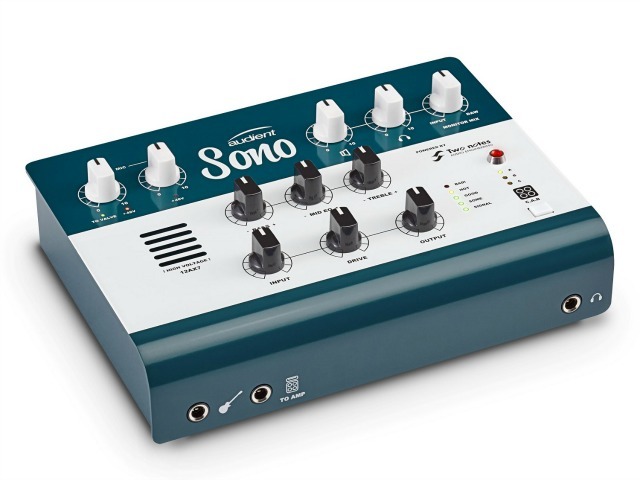 Featuring an on board 12AX7 analogue valve and 3-band Tone control alongside two notes Torpedo power amp modelling and cab simulation, Sono provides countless tonal options for guitarists, whether they’re recording, practising or gigging. With near zero latency, Sono doesn’t get in the way of creativity. Monitor mix allows blending between the guitar input signal and DAW playback, ensuring delay-free recording, playback and monitoring, enabling the artist to stay in the creative zone with none of the latency problems you get when tracking with software. In addition, Audient encourages Sono users to integrate their existing pedalboard. Andy explains, “Plug in your favourite distortion, reverb and delay pedals directly into Sono’s D.I, dial up a tone and instantly start recording or jamming without the need to mic up and play through a noisy amp (or annoy your neighbours). “However, if you do want to record in the more traditional sense, Sono will always record a clean D.I signal, so you can capture your performances as creativity strikes and reamp through your favourite hardware amps later without the need to buy a dedicated re-amp box,” says Andy. Alongside the more guitar-centric features, Sono is a powerful interface in its own right, with two Audient console mic pres for studio quality recordings, expandability up to 10 inputs via ADAT for recording drums, class leading converters as well as the unique ‘to valve’ feature. “Try routing vocal microphones or synths through the classic valve preamp, analogue EQ and two notes processing and start creating crazy new sounds or simply add that classic analogue warmth to your recordings,” adds Andy. A philosophy of providing world class, affordable and accessible technology with the aim to capture and enhance creativity has seen Audient build a strong community of creative users in professional and home-studios worldwide. Impeccable performance and reliability can be seen throughout the versatile product range, from the flagship ASP8024|HE Heritage Edition studio console through the iD USB audio interfaces, the ASP series of rack mount mic pres and the compact analogue desk, ASP4816. Sono is expected to ship in the first quarter of 2019 and will retail at USA MAP $449, £419.99 inc VAT or 449 Euros (inc local VAT).